The story of our life, each chapter, unfolds as it should. This year, the chapters that I’ve written and that have been written for me, I do not understand right now. But each chapter builds on the next as the plot thickens and the characters that enter our story gently hold our hand and lead us deeper into our story. For many years, I’ve shared the stories, antics and adventures of Molly my Samoyed and Lily my Golden Retriever. My parents made it in here quite a bit as well. They have been the main characters for so long that where they end and I begin is hard to separate. We define each other. Those closest to us make us our best self as they patiently hold us through our not-so-best self. Losing Dad in April, Molly in June and Lily in October has left me wandering a bit, trying to get back to my center. As I have bided time, as we all must, I’ve have accepted my “new” normal and continue on. And while it often seems like forever, we do heal, we do become whole again in a different way. And now the next chapter. 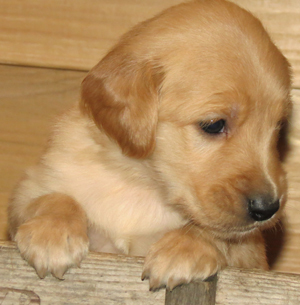 Abby, a sweet golden retriever who will be joining my family on December 16th. As we mark our days of loss, we must also mark our days of joy and anticipation. And joy is so much sweeter when we’ve been on the other side. Abby follows a long line of best friends who have come before to shape me with their canine wisdom and unconditional love, making me a better human. Greta, Misha, Elly, Molly, Lily – my characters that have come before remain in my story even today. No one or nothing that ever comes before is ever truly gone. The best of them remain in us. Abby joins a line of wonderful characters and she will be her own unique character, bringing all new adventures and creating the next chapter. Our life is not one word, one line, one page, one chapter. It is woven together to make up a composition. Keep writing your story and allow others to write on the pages as well. The final chapter will come all too soon, so enjoy today’s page and cast light. Such a poignant and beautiful post — I’m so happy to read Abby will find her forever home with you! What a gift to everyone she will be. Many blessings. Thank you so much! I appreciate your kind comments. Sorry for your loss. In the depth of our loss, we learn that we are not alone and are all connected. Abby has been here 24 hours and I feel joy again. Life works out but the hard part and the gift is going through not around. Merry Christmas! I have neglected my blog reading this past year, and am so sorry to hear of all the losses you endured. Isn’t it wonderful our heart always finds room to love again, even as it maintains a hole of grief. Enjoy the unconditional love of a new four-legged family member. Amen – so well said.